The grapevine wreath lay before me. Fresh eucalyptus branches oozed their scent permeating the air. Pruning shears clipped individual stems. Each one was placed strategically into the curved and twisted grapevine. Discards were thrown to the side ready to be disposed. I looked at the last discard and looked again. That was not trash. There He was. Leaves formed His crown, his arms outstretched, even the wound in His side was visible. This nothing became something. Beyond proportions ever imagined the little piece of assumed waste became sacred. Something beyond was present. A lesson on the epitome of humility. It only seemed appropriate to place it in the center of the wreath. Like Him in the center of my life. With reverence it was given its position of honor on the front door of our home. Weeks passed. 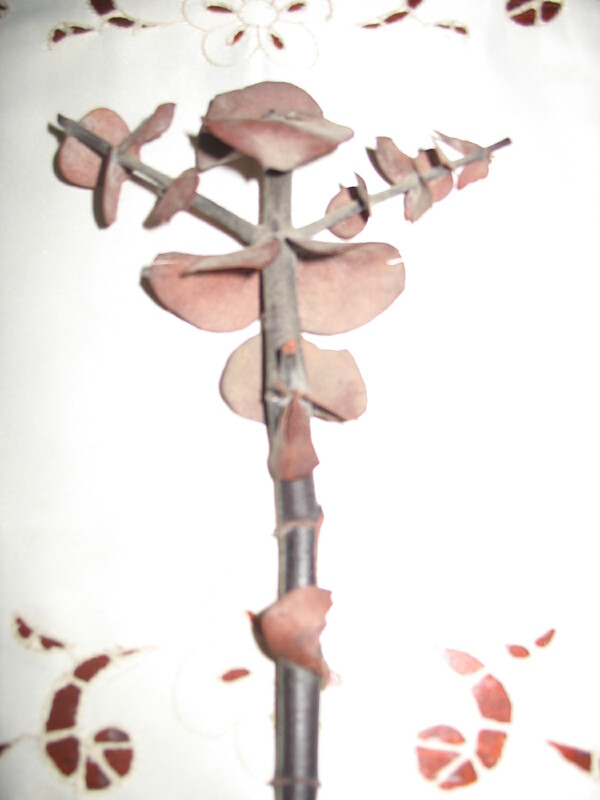 While cleaning the window panes on the inside one Saturday I noticed a substance dripping from the eucalyptus cross. 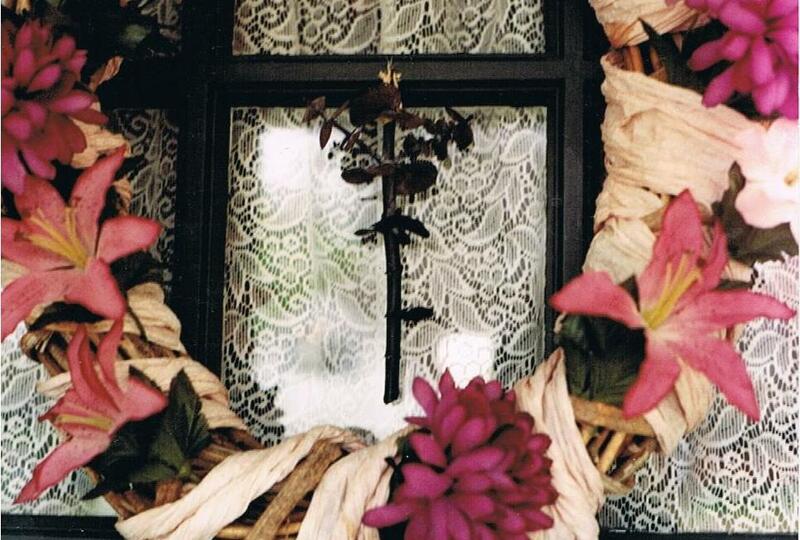 It spilled out over the ribbon and flowers on the wreath with streaks running down the door to the ground below. How could this substance cry out to me, "I died for you?" Stunned, I fell to my knees. The value of the little piece I was going to throw away took on monumental worth. When friends heard the story, lessons on the blood covenant were shared. Years later it has its place of honor on our dining room buffet reminding me that something can be made of nothing. And especially that Jesus, Our Lord, humbled himself to the wood of the cross. Thank you my dearest friend for opening up yourself and sharing so openly and transparently. When I was teaching creative writing, I tried to get my students to see that when we are the most vulnerable is when our writings speak the most. God spoke to me through this. Beautiful, just exquisite! May our dear Lord bless you both abundantly for your kindness and generosity. What a wonderful post. I'm so glad you shared it with us on Spiritual Sundays. Excellent post, powerful and humbling. Thank you so very much! Beauitful in it's simplicity and poignancy. I love that you have kept and treasured not only the piece but your love for what it represents. This is beautiful. I'm so glad you shared this today.How nice that you saved the eucalyptus.